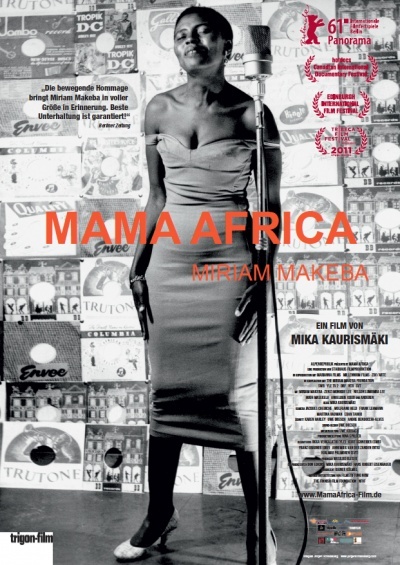 MAMA AFRICA is the a celebration of the life and times of South African singer and activist Miriam Mekeba. It's told via archival footage and interviews with friends and family. The film is like getting to know the feel of it's subject rather than a straight forward biography of her life. I think the best term would be tone poem, which considering the wall to wall and non-stop music is, I think apt. We watch how Miriam sings, gets involved in politics (though as she said "I never sing about politics, I only sing the truth"),raises a family and sings some more. Its a wonderful celebration of a life and of music. I grew up on the music thanks to my moms (both of them) who loved the songs, so I was in heaven as long as the songs played. The trouble for me came about half way in when I realized that as good as an over view of the life the film is, it really isn't all that detailed. I mean once we get passed about 1964 any sense of time goes out the window (We learn of the death of her daughter and how it affected her only to jump back in time to talk about her and other things.) It's a quibble of a sort since the film is very entertaining and the sort of thing I'll get on DVD just so I can use the film as a sort of musical mix.